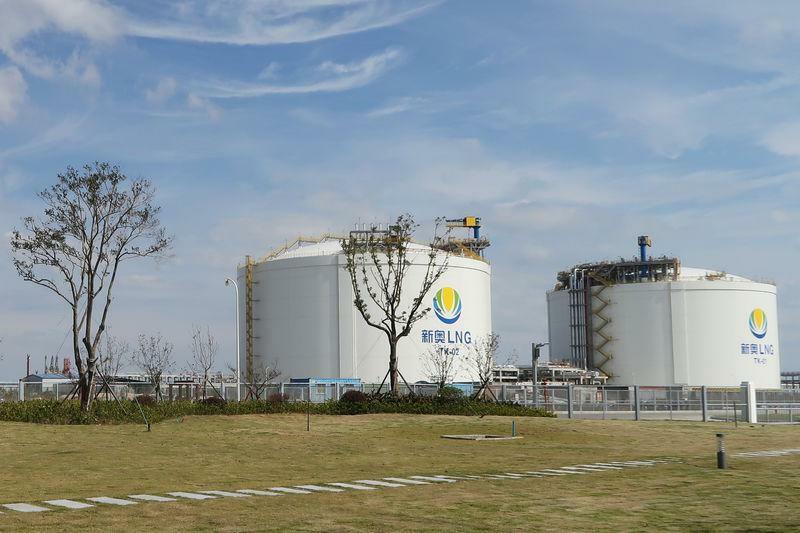 SINGAPORE (Reuters) - Asian spot prices for liquefied natural gas (LNG) tumbled nearly 10 percent this week to a more than three-month low, knocked lower by a slide in oil prices, forecasts for a warmer than average winter and ample supply onshore and in tankers. Spot prices for January delivery in North Asia were estimated at $10 per million British thermal units (mmBtu), 90 cents lower than last week, according to traders. "The big question mark right now is how the weather will pan out as the market will quickly turn once it starts to get cold. But until then, it's tank-top right now in many places," said a Singapore-based LNG trader, referring to high storage levels of natural gas in North Asia. Temperatures in major cities Tokyo, Beijing and Shanghai in the world's top two LNG buyers, Japan and China, are expected to be warmer than usual next week, weather data from Refinitiv Eikon showed. Demand from end-users in North Asia remained muted while a big drop in Brent oil prices was causing jitters in the LNG market, trade sources said. Oil prices slumped to 2018 lows on Friday, pulled down by concerns of an emerging global supply overhang amid a bleak economic outlook. "Typically, changes in Brent tend to have a bigger impact on Asian LNG prices due to lack of liquidity in Asian gas derivatives," said a second Singapore-based LNG trader. Trading remained thin in the region with several LNG tankers still floating the super-chilled fuel around Asia. But the situation may soon stabilise as end-users have stopped reselling cargoes, the trader said. "The Chinese are not reselling cargoes like they were doing recently, so I think situation could be bottoming out," the trader added. In tenders, India's GSPC is seeking two cargoes for delivery in December, while Gail India may be offering to sell a December-loading cargo from Cove Point in the United States, traders said. The Indian importer has 20-year deals to buy 5.8 million tonnes per year of U.S. LNG in total, split between Dominion Energy's Cove Point plant and Cheniere Energy's Sabine Pass. Angola LNG offered a cargo for December, but the results were not immediately clear. An LNG tanker was transferring a cargo of Russia's Yamal LNG to another vessel off the tip of northern Norway on Thursday, the first such operation that will help the facility raise production.